Event Hubs is a data and event processing service for Microsoft Azure. 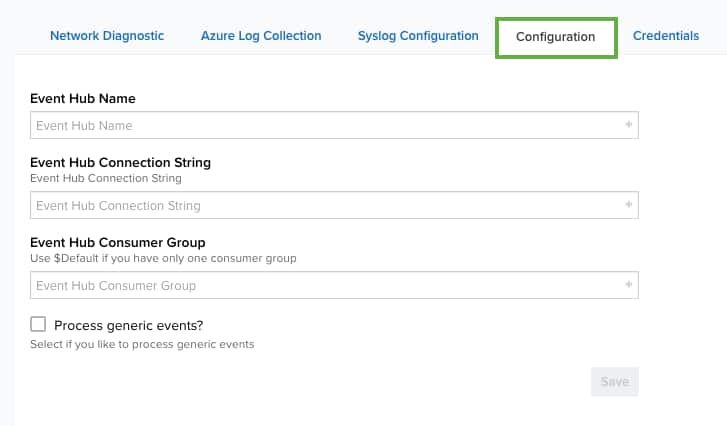 You can configure your Azure sensor to receive and process information from Event Hubs and in your USM Anywhere environment. To begin setup and configuration, you first need to create an event hub in the Azure portal online. Follow the process documented in the Microsoft's Azure documentation to create your resource group, namespace, and event hub. After you complete the initial setup, create a new policy to allow your event hub to communicate with USM Anywhere. In the Azure portal, click Shared Access Policies in the sidebar. Create a policy, and click the Listen Permission checkbox. Copy the connection string listed in the policy (this will be used in the next to connect the event hub in USM Anywhere). After you've completed the event hub setup, follow the steps in the Set up auditing for your database section of Microsoft's Event Hubs documentation to configure SQL event auditing. Go to the Sensors page and open the Azure sensor.